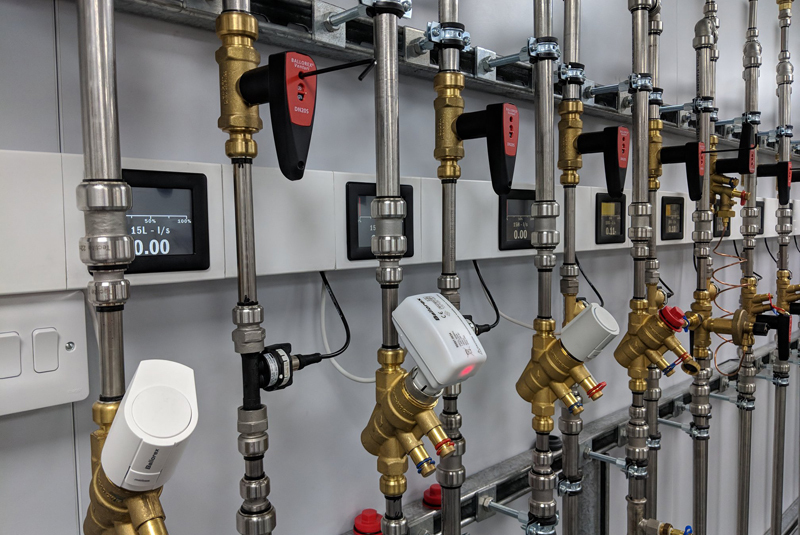 The aptly named ‘valves wall’ houses a Grundfos Magna 3 pump which delivers a head pressure up to 15 metres and provides all or just some of the systems with their requirements depending on learning needs. The training provided by Glenn covers differential pressures and how to deal with them, what effects control valves have on velocity noise and flow rates and how to lock valves and change flow. Glenn continued: “This is a really immersive room that engages most senses. Visitors can see just what happens to flow rates and pressures thanks to the visual display units which monitor each valve, they can get hands on and change pressures according to requirements and see how a quarter inch turn can affect pressures, they can also hear velocity noise and alter valves accordingly.